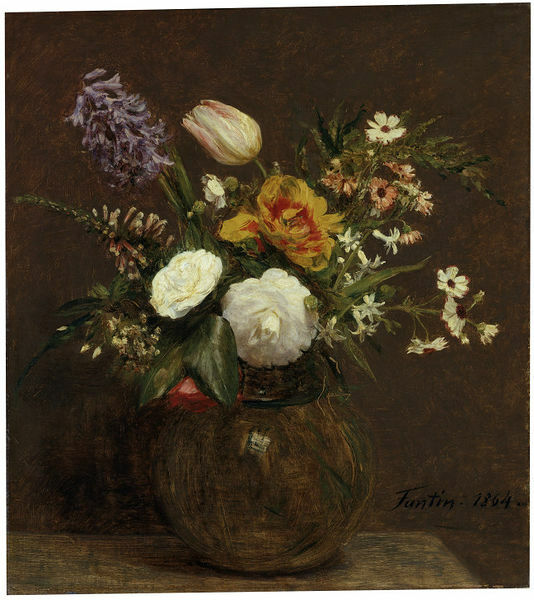 This painting is a fine example of Fantin-Latour's early flower piece, a category in which he progressively specialised executing up to 500 floral compositions. This painting shows a bouquet of tulips, camellias, hyacinths, holly hocks and several rustic flowers in a vase on a table. The attention here is drawn on the rich combination of textures and tones, which contrast with the plain dark background. These effects of light and colour are characteristic of the new naturalism developed in French art in the second half of the 19th century, which anticipate the Impressionists' new experimentations. Tulips, camellias, hyacinths, holly hocks and wild flowers arranged in a transparent vase on a table, against a dark neutral background. Bought from the artist in July 1864 (with CAI. 128) for 500 francs (ca.£20) by Constantine Alexander Ionides; November 1881 listed in his inventory (private collection), as one of three paintings of 'Flowers' by Fantin Latour (the others being CAI.128 and CAI.130), each valued at £40; Bequeathed by Constantine Alexander Ionides, 1900. 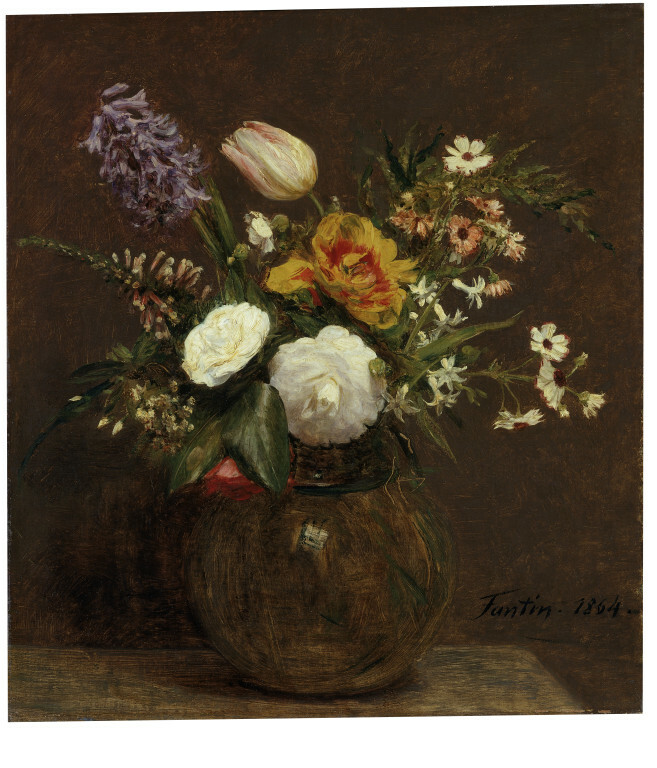 Historical significance: This painting is a characteristic example of Fantin-Latour's early flower paintings. It shows a composition of different flowers harmoniously arranged in a simple vase on a table, probably set in a domestic interior. This picture draws the attention onto the contrast between light and shade, the brilliant colours of the flowers against the formless plain background. The artist shows here sensitivity for the rendering of different textures: tulips, camellias, hyacinths, holly hocks and more rustic flowers alternate in an explosion of tones and colours. It is very close in composition to another painting of the same date also in the museum's collection (CAI.128). The artist never thought of his flower paintings as pairs, but they were usually purchased as such by his British patrons. 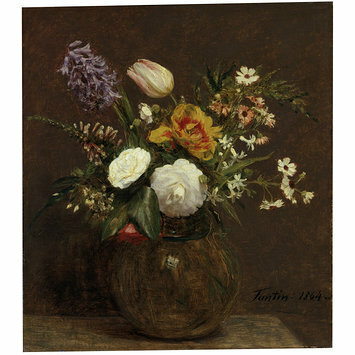 This is one of 8 paintings brought to London by Fantin on his third visit in July 1864. Thanks to his friendship with James McNeill Whistler (1834-1903), whom he met in 1858, Fantin-Latour was introduced to British collectors such as Alexander Ionides and his son Constantine, who bought two other still life paintings by the artist (CAI.129 and CAI.130). Although this painting was painted in France, London was the principal market for Fantin-Latour's flower pieces, and in 1871 the amateur etcher and dealer Edwin Edwards purchased all of the painter's stock for sale in England. The Ionides bequest of 1901 doubled the size of the museum's collection of flower pieces by Fantin-Latour, which already included three painting acquired in 1882, 1884 and 1889 from Mrs Ruth Edwards, the widow of Edwin Edwards (see S.Ex.61-1882, S.Ex.24-1884 and S.Ex.4-1889). The Barbizon school encouraged a new interest in naturalism and the objective rendering of light and colours, which was continued by the Impressionists. However, Fantin-Latour did not share their enthusiasm for open air painting and most of his compositions were executed in his studio. Kauffmann, C.M., Catalogue of Foreign Paintings, II. 1800-1900, London: Victoria and Albert Museum, 1973, p. 36, cat. no. 79. V. Dubourg Fantin-Latour, Catalogue de l'oeuvre complet (1849-1904) de Fantin-Latour, Paris, 1911, p. 34, no. 245. F. Gibson, The Art of Henri Fantin-Latour: his life and work, London, 1924, pp. 112, 226. B.S. Long, Catalogue of the Constantine Alexander Ionides collection. Vol. 1, Paintings in oil, tempera and water-colour, together with certain of the drawings, London, 1925, p. 24. Andrew Watson, 'Constantine Ionides and his Collection of 19th-Century French Art', Journal of the Scottish Society for Art History , vol. 3, 1998, pp.25-31 -cf. p.68, nn.5,6.